By now you’ve probably noticed that plastic straws are nowhere to be found in the Hawk’s Nest Dining area. But, are you aware of why this switch from plastic to paper straws was made? This blog will help explain the reasoning behind this change and how it will ultimately improve our environment. What Prompted the Switch from Plastic to Paper Straws? Back in September 2017 a campaign, which later became known as Strawless in Seattle, was launched to motivate businesses to stop using single-use plastic straws. The purpose of this campaign was to encourage business owners to start making environmentally-friendly changes that could help preserve the oceans. As a result, over 150 restaurants supported this movement and over 2.3 million single-use plastic straws were removed from the state of Washington in only one month. Fast forward a year later and Seattle became the first major city in the U.S. to officially ban plastic drinking straws. This inspired other U.S. coastal cities such as Malibu, CA and Miami Beach, FL to adopt similar bans. Lonely Whale’s efforts to preserve our oceans also prompted the #StopSucking video campaign. How Are Plastic Straws Bad for Marine Life and the Ocean? 71% of seabirds and 30% of turtles have some kind of plastic in their stomachs. Ingested plastic can increase the mortality rate of marine life by 50%. Since plastic doesn’t biodegrade, it can take up to 200 years for a single plastic straw to decompose. Americans currently use 500 million plastic straws a day. At this rate, by 2050 there could feasibly be more plastic than actual fish in the ocean. Plastic straws are among the top 10 most discarded items on beaches. 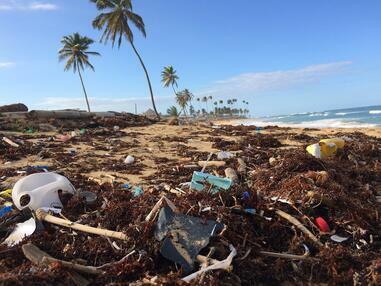 Every year plastic causes $8 billion in damage to marine ecosystems. Are Plastic Straws Bad for Humans? Believe it or not, plastic straws are not just bad for the environment, but also for you! According to a Washington Post article, here are a few lesser-known, health-related reasons to ditch plastic straws. Gas & bloating. Sipping from a straw introduces air into the digestive tract, which could cause uncomfortable digestive symptoms like gas and bloating. Cavities. Drinking sugary or acidic beverages through a straw can increase the likelihood of cavities. Straws send a concentrated stream of liquid toward a small area of the teeth, which can erode enamel and cause tooth decay. Chemicals. Most single-use plastic straws are made from polypropylene, a type of plastic commonly made from petroleum.There's evidence that chemicals from polypropylene can leach into liquids and may release compounds that could affect estrogen levels, especially when exposed to heat, acidic beverages or UV light. Wrinkles. Regular use of straws can also lead to the same wrinkles that smokers get around their mouths. These “pucker lines” could persuade the masses to stop using straws. Excess sugar & alcohol consumption. It’s been argued that sipping liquids such as soft drinks through a straw could contribute to excess sugar intake. The thought is that straws cause you to gulp down a greater volume of liquid more quickly than drinking from a glass or cup. Plus, people aren’t very accurate about estimating how much liquid they’re taking in, especially if they’re distracted by a movie or smartphone screen. What Are Some Alternatives to Plastic Straws?